I'm watching how you manipulate circulation over time. Back in 1995, life was good, and catalogs were at the top of the food chain. Quite honestly, we were lazy back then ... profit was just sitting there, waiting to be harvested, and we didn't pick it all up. It was common to see a profit factor of 30% - 30% of demand flowed-through to profit. I recall arriving at Eddie Bauer in 1995 - I saw metrics in the 25% to 29% range - and that company generated 5% pretax profit. That's some serious laziness, when your gross margins were more than 50%. In 2004, we applied matchbacks. Catalogs weren't quite as productive as in 1995, but we managed declining productivity by cutting costs (yielding a profit factor of 35%). As a result, slightly higher book costs and better profit factors and lower productivity yielded about the same amount of profit. Since 2004, customers fled to the internet. 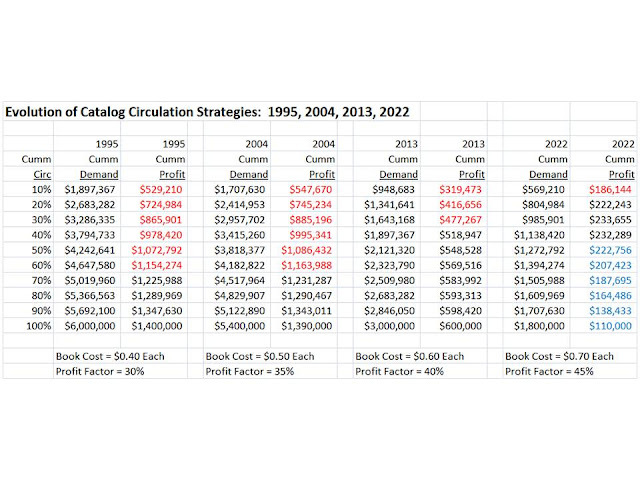 Today, it is very common for pure catalogers to see between 50% and 80% of demand happen anyway, without mailing a catalog ... and for catalogers with customers age 65ish, the ratio is between 25% and 50%. This leads to dire consequences for the catalog (not corporate) profit and loss statement. And in 2013, those under the age of 30 have now fled the internet, moving to a hybrid of mobile+social ... moving two full steps away from the catalog business model. In response, we cut even more expense - today, it's common to see 45% to 50% of demand flow-through to profit. That's amazing! And thoroughly depressing. We accomplished this by removing humans from our business. No humans at the call center (out of necessity). No humans in the information technology department (outsourced to vendors). No humans in customer acquisition (outsourced to co-ops). No humans in search (outsourced to vendors). No humans in email marketing (outsourced to vendors). No humans analyzing results (outsourced to matchback/attribution experts). No humans in the warehouse (outsourced to robots). No humans managing the website (outsourced to vendors). No humans managing cross-selling, pay-per-click, retargeting (outsourced to vendors). Yes, we still have humans coordinating these programs - but not managing these programs. There is a big difference between being accountable, and holding vendors accountable. What happens when we remove humans from merchandising and creative? But we get to keep mailing catalogs. Take a look at the red numbers in the table. 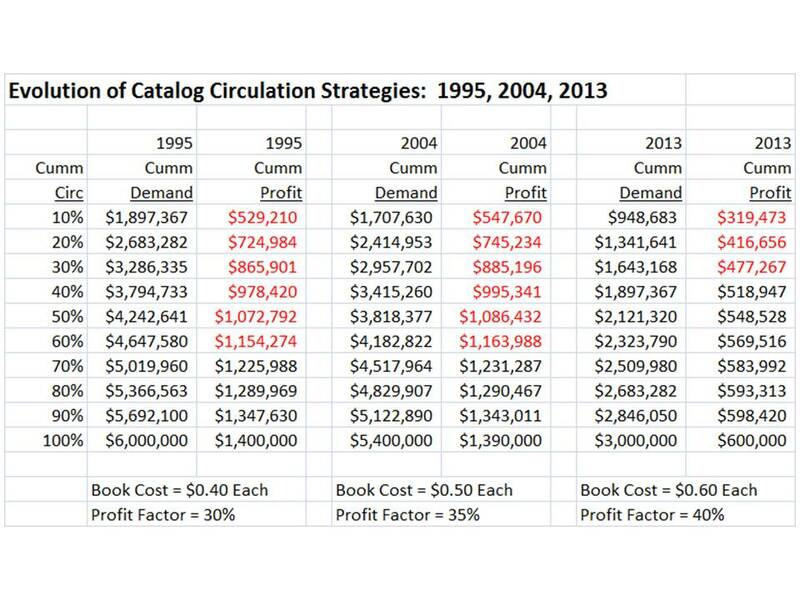 In 1995, 80% of the profit came from 60% of the circulation. 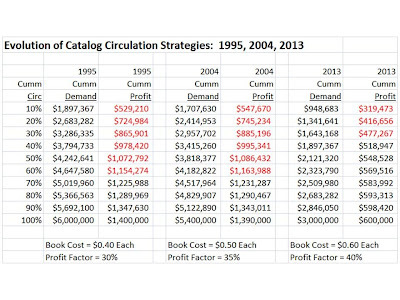 In 2004, 80% of the profit came from 60% of the circulation. In 2013, 80% of the profit comes from 30% of the circulation. In other words, the economics of catalog marketing are changing. 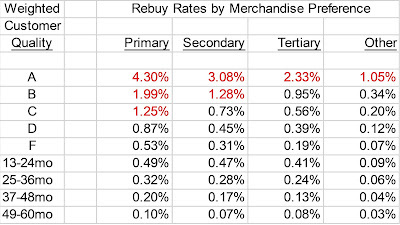 There's only so much expense that can be trimmed ... and catalog costs will continue to rise ... and demand will continue to leak out of the catalog ecosystem into e-commerce (and mobile), leaving fewer and fewer catalog-centric customers to mail to. 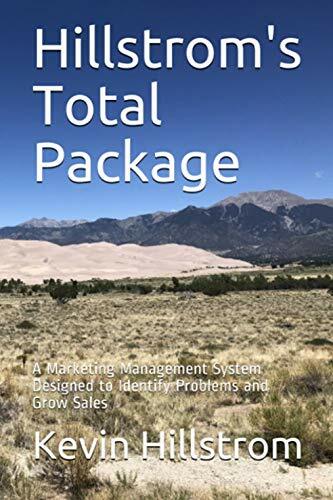 In 2022, given current trends, productivity will drop further, as e-commerce is old-school, mobile is established, and hologram marketing is capturing market share. This leaves us with little profit - no amount of financial manipulation fixes the problem. And did you notice that profit is close to unchanged at any circulation level? Some will cut back to almost no circulation at all - some will push their chips all-in and mail deep - and everybody will make peanuts, regardless. It's already happening! Has anybody pointed this out to you? Have your marketing team perform this analysis for you, over time. Apply proper incremental rates after evaluating mail/holdout tests. You're going to see something similar to this table. How does this analysis change your thinking about the future? I know, nobody talks about this. But if your average customer is age 55+, the 2022 scenario is coming. For many, it's already here.